I have been teaching for a number of years many upanisads but I never attempted to publish a book on any one of them. To prepare an edited copy from the transcripts of classroom material is a difficult task. It is so because the textual discussions in the classes imply a lot of topics such as grammar, bhasya, purva-paksasiddhanta and so on, making the transcript a big potpourri of different ideas. To bring out these as a readable text with a cogent flow of thought takes a lot of skill and patient editing on the part of someone who knows the subject matter very well. The Mundakopanisad is presented as the first book, in the upanisad series by the Arsha Vidya Research and Publication Trust, Chennai, thanks to the efforts of Sri Swami Sakshatkritananda Saraswati. With his incredible patience and scholarship, the swami could prepare the manuscripts leaving nothing to be desired. His services being available for the Publication Trust, we all can eagerly expect more books of this class. In the previous section the limited ends that can be accomplished through various means stated in the karma-kanda, that is, apara-vidya, was discussed briefly. Now para-vidya is taken up again and unfolded. Sankara introduces it as follows. The subject matter of para-vidya is aksaram brahma that was earlier revealed as one not subject to decay and death. The upanisad defined para-vidya as the that vidya by which aksarm brahma is understood. Then, the results of apara-vidya were mentioned pointing out their limitations in order for one to discover in oneself a dispassion towards limited ends and develop a value for the subject matter of para-vidya. The sastra thus helped to create the adhikarin for the para-vidya. Now the upanisad takes up the original request on the part of Saunaka, namely, the knowledge of that, knowing which everything is as well known. That is the subject matter of para-vidya. The teacher points out who laksanas, modes of revealing Brahman. Both of them are very important. One definition unfolds, by implication, the svarupa, essential nature of Brahman. The other is tatastha, an incidental definition, involving something distinct from the nature of Brahman, but by which it is known. This definition is meant to show that Brahman is not one of the objects in the world, but is the very cause of the world. Without the incidental definition one cannot understand Brahman as everything. The world as well as one’s physical body, mind and senses are non- separate from Brahman. It does not mean Brahman has undergone a change to become all this. Had it been so, then Brahman would not be available at all for knowing. In the svarupa-laksana one gets to know Brahman as neither the cause nor the effect. The cause-effect set-up is to prove that any effect is mithya and it depends upon satya which is Brahman. So, all that is here is Brahman. That Brahman is ‘I,’ the caitanya atman. Therefore, I am everything. By the knowledge of atman, everything is as well known. In the following mantras both the above definitions are well brought out. I have been teaching for a number of years many upanisads but I never attempted to publish a book on any one of them. To prepare an edited copy from the transcripts of classroom material is a difficult task. This is so because the textual discussions in the classes imply a lot of topic such as grammar, bhyasa, purva-paksa-siddhanta and so on making the transcript a big potpourri of different ideas. 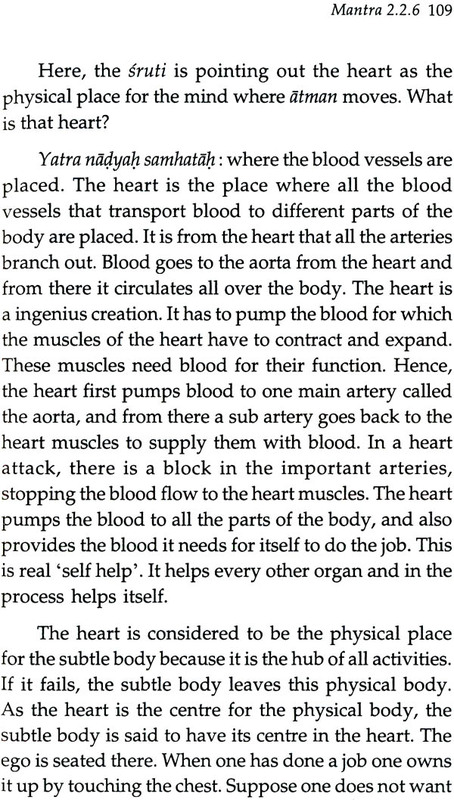 To bring out these as a readable text with a cogent flow of thought takes a lot of skill and patient editing on the part of someone who knows the subject matter very well. 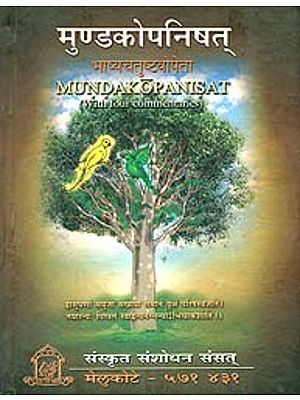 The Mundakopanisad is presented as the first book, in the upanisad series by the Arsha Vidya Centre, Research and Publication, thanks to the efforts of Sri Swami Skakshatkritananda Saraswati. With his incredible patience and scholarship, the swami could prepare the manuscript leaving nothing to be desired. His services being available for the Centre, we all can eagerly expect more books of this class.